Welcome to our companion site for McAllister, E: Pipeline Rules of Thumb Handbook: A Manual of Quick, Accurate Solutions to Everyday Pipeline Engineering Problems, 8th Edition brought to you by Elsevier. 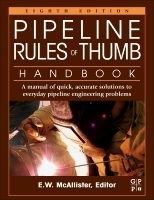 For over thirty five years, Pipeline Rules of Thumb Handbook has served as the "go-to" daily reference for solving the most day-to-day pipeline workflow problems. Our new edition includes 30% enhanced chapters on important operational problems such as valve actuators, shorted casings, variable frequency drives and the effect on pump and pumping systems. We hope you will find our interactive features to be useful and efficient for you in your day-to-day activity. Be sure to register on this site to receive updates on our interactive features and additional information related to our other pipeline engineering products. Please note that in order to receive full functionality of the widgets, your browser should be Internet Explorer 10 or 11, Google Chrome, Safari, or Firefox 10. If you do not have any of these browsers or have any difficulty getting access the features, please feel free to contact our help line on our Elsevier store. Thank you again for your interest in our publication. Copyright © 2014 by Elsevier All rights reserved.